Back To OKC! Florida State Takes Two Over LSU To Advance To WCWS! TALLAHASSEE, Fla. — Between arriving at JoAnne Graf Field at 3:00 p.m. on Saturday on the verge of elimination and Carsyn Gordon catching the final out at first base at 12:33 a.m. on Sunday, there were more than nine hours of fight and determination from the Seminoles as No. 6 Florida State (52-11) defeated No. 11 LSU (45-17) in both games of a doubleheader to win the 2018 NCAA Tallahassee Super Regional and advance to its 10th Women’s College World Series in program history. The Noles topped the Tigers by a score of 8-5 in 11 innings in the first game of the day which spanned over five hours and included a 78-minute weather delay. FSU followed it up with a 3-1 victory over LSU in the wee hours of the morning at JoAnne Graf Field, where many of the 1,431 in attendance remained to celebrate with the home team. Jessie Warren carried the Seminole offense in both games as the senior hit a home run in each game and drove in four RBI on the night. She moved into ninth place in NCAA history with 269 career RBI and now is in sole possession for 10th place in the NCAA with 81 career home runs. 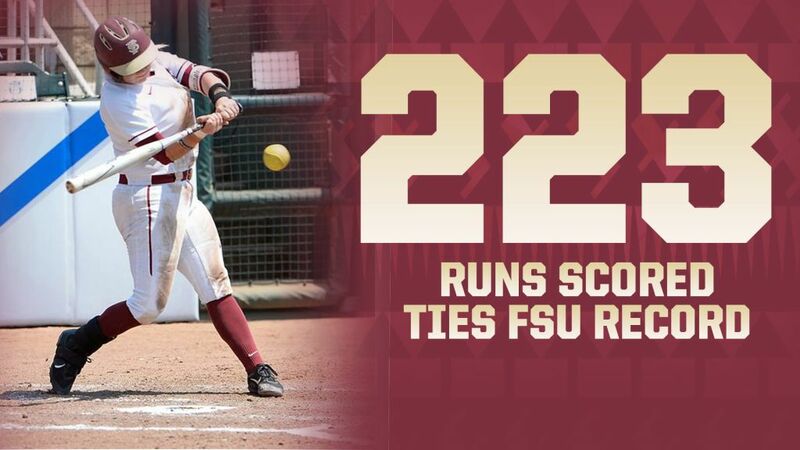 She also scored her 223rd career run to tie Shamalene Wilson (1993-96) for the Florida State record. “First of all, congratulations to LSU on an amazing season,” said FSU head coach Lonni Alameda. “That was a battle today. (Allie) Walljasper and (Carley) Hoover are two amazing pitchers and it is always an honor to play a team like that, that plays the game hard and to the very end. Florida State had runners in scoring position in each of the first two innings, but could not scratch a run across. Warren reached on a dropped third strike to lead off the top of the first and stole second, but was left on base after a pair of line outs. Zoe Casas lined the first pitch of the FSU second inning off the third base bag for a double into the left field corner and moved up to third on a wild pitch. The next three Seminoles were retired in order to keep the game knotted at 0-0. LSU opened the scoring in the bottom of the second as the Tigers started the inning with a single by Amanda Doyle followed by Shemiah Sanchez getting hit by a pitch. A one-out RBI single by Shelbi Sunseri put LSU up 1-0. FSU starting pitcher Meghan King retired the next two batters on a pop out and a strikeout to end the inning. The Seminoles battled back with four runs in the top of the third inning to take a 4-1 lead. Morgan Klaevemann opened the inning with a walk and Warren crushed career home run No. 80 over the left field wall to put FSU in front, 2-1. Gordon followed with a walk on four pitches, stole second and moved to third on a groundout. Anna Shelnutt placed a perfect squeeze bunt with one out and Gordon slid under the tag at the plate to make it 3-1. Casas grounded a ball toward LSU 2B Becca Schulte and the fielder tried to draw contact on Shelnutt running to second instead of fielding the ball, allowing Casas to reach on a single. The Seminole runners moved up to second and third on a wild pitch by LSU starting pitcher Carley Hoover, and Cali Harrod drove in her 29th RBI of the season with a sacrifice fly to left. LSU started their half of the third with a single by Aliyah Andrews and a double from Taryn Antoine. King left them both stranded after retiring the next three hitters on a groundout, a strikeout and a fly out. The Seminoles scored an unearned run in the top of the fifth to extend their lead to 5-1. Sydney Sherrill drew a one-out walk and an infield single from Shelnutt put runners on first and second. A fly out moved Sherrill to third with two outs and LSU nearly got out of the inning as Hoover forced Harrod to pop up in foul ground by third base, but LSU 3B Sanchez thought that the catcher was calling her off and she let the ball drop. Harrod’s at bat continued and she hit an RBI infield single to first base for a 5-1 FSU lead heading to the bottom of the fifth. LSU tied the game at 5-5 with a grand slam by Sanchez in the bottom of the fifth inning. Andrews singled to lead off the inning and walks to Emily Griggs and Doyle allowed Sanchez to square the game with her seventh HR of the season. The Seminoles managed to get the leadoff batter on base via walks by Gordon in the seventh and Klaevemann in the ninth, but couldn’t move them around. King settled in and retired 14 for 15 LSU hitters, including six strikeouts, as the game headed into the tenth inning. Florida State managed to load the bases with two outs on a hit-by-pitch to Casas, a walk by Harrod and an LSU error off the bat of Cassidy Davis, but after a pop out to short the game remained tied at 5-5. LSU threatened in the bottom of the tenth as a walk to Griggs and an FSU error put Tiger runners on first and second with two outs, but King ended the inning with her 11th strikeout of the game. Gordon gave the Seminoles a 6-5 lead with a solo home run to left with one out in the top of the 11th. Sherrill followed with a single through the right side and Shelnutt crushed a two-run HR to Spirit Way beyond the wall in left for an 8-5 FSU advantage. LSU managed a leadoff single in the bottom of the 11th, but King set down the next three hitters to force game three. King (22-6) set career highs in strikeouts (12) and innings pitched (11.0) and allowed five runs on eight hits with four walks in the complete-game victory. LSU led off game three with a bunt single by Andrews, but an amazing defensive play by Warren sent her back to the dugout on a double play. Antoine tried to place a sacrifice bunt, but she it popped up and the senior third baseman made a diving catch in foul ground and threw to Sherrill at first for the double play. FSU starting pitcher Kylee Hanson ended the inning with a fly out to center. Warren worked her magic again in game three, giving the Seminoles a 2-0 lead in the bottom of the third with a two-run home run to left center. Davis opened the inning with a walk and was pinch-run for by Deja Bush. Warren launched her second HR of the day to put FSU in front. The inning continued with a walk by Gordon and a double by Sherrill, her 27th of the season which moved her into a tie for second in ACC history and tied for fourth in NCAA single-season history. 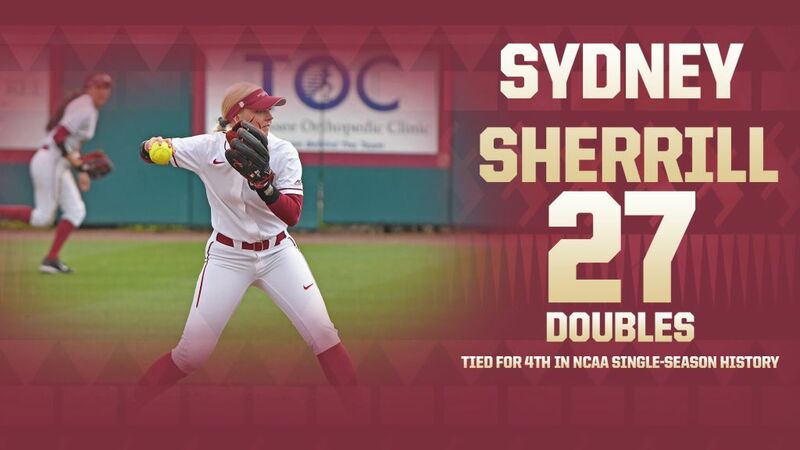 Shelnutt hit a sacrifice fly to center to score Gordon and make it 3-0 Seminoles after three innings. The Tigers got a run back in the top of the fifth as a single by Sanchez and a double by Sunseri put runners on second and third with one out. An RBI groundout by Amber Serrett cut the Seminole lead to 3-1, and Hanson retired the next hitter on a groundout to end the inning. LSU started the top of the seventh inning with an infield single, but a ground ball to Sherrill at second base started a 4-6-3 double play to bring up the final chance for the Tigers. Hanson handled a ball back to the circle and tossed to first to end the game and send the Seminoles to the WCWS. Hanson improved to 28-5 on the season and scattered five hits and allowed one run and one walk with four strikeouts in the complete game win. The Seminoles will face No. 3 UCLA (56-5) at 9:30 p.m. ET in the first round of the 2018 Women’s College World Series. The game will be broadcast on ESPN and tickets are available at www.ncaa.com.